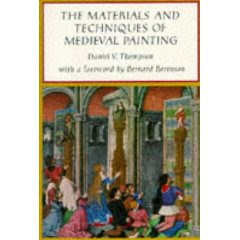 So, I've been reading the book "The Materials and Techniques of Medieval Painting" by Daniel V. Thompson. (Thanks for the Christmas present cousin Debbie!) It's a great read, and I highly recommend it. But Dan, I can't help but imagine your voice as anything other than a woman's! Don't know why, but it's true. Anyway, I've never really liked painting on canvas. It's a hard to do detail work with all those bumps. Reading his book, I've found that the surface of choice back in the day was wood panels, primed & prepared with gesso and plaster and other stuff. With glue made from cheese. Thats just too cool! Who knew that cheese and lime could make glue?! I've been avoiding the whole making the canvas part of this project for a while. I mean, canvas involves growing stuff, and rotting (er, I mean retting) and beating the crap out of it, then spinning it & weaving it etc. How frickin' girly. Except the beating part. That can't be easy. I don't know what it is, but I just don't like most fabric arts. There was some really huge 'soft sculptures' (let's be honest, they were stuffed plushies on steroids) at a modern art muesum the first time I went to LA. I was not impressed. Now wood is a different story. To make a wood panel, I first will need to make some wicked cool metal tools. That means I'll have to do pretty much everything except maybe the smelting. Casting, forging, sharpening, trying to figure out if I really need to smelt tin to mix with copper to make bronze or if *ANYONE* on earth had tin back in 4004 BC. That could be very cool. Cool, because this will involve fire, furnaces, hacking and cutting. The artistic equivalent of shoveling the snow in the dead of winter while exiled in Siberia. I'm pretty sure I can work carving in there if I try hard enough. Actually a lot of wood panels had carved inlays in the work. So there. I can. I'm much more excited about this now. Anyone know the building codes of Seattle, and if permits are needed for kilns & furnaces and the like in one's backyard?